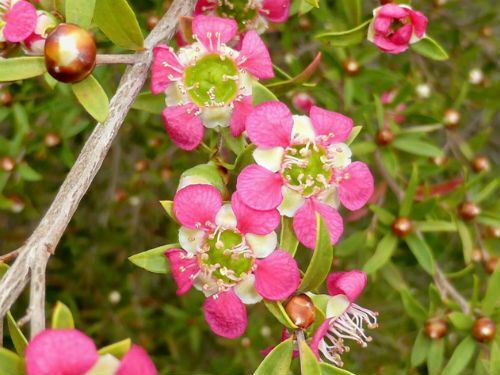 Leptospermum ‘Aphrodite’ originated from Bywong Nursery, in southern NSW and was found in a batch of Leptospermum spectabile seedlings. Leptospermum ‘Aphrodite’ is a medium to tall shrub that reaches a height of at least two metres in our cold climate garden and develops into a dense shrub. Foliage is lush green. In spring the branches become covered with bright pink flowers. A wide range of native insects are attracted to the flowers. Light pruning after flowering is appreciated. Leptospermum ‘Aphrodite’ would be an ideal addition to a hedge or screen. Propagation should be from cuttings to preserve the desirable characteristics of this colourful cultivar. Leptospermum ‘Rudolph’ is another variety from Bywong Nursery. One of its parents is also L. spectabile a rare species from the Colo River, north of Sydney (see L. Rudolph article).